The workers' re-education camps (AEL) were set up in 1940 by the Gestapo in order to re-educate individuals accused of acts of industrial sabotage or who, for some reason, were held to be “reluctant” to work. In effect, these camps were also a means of exploiting forced labour. It has been estimated that in Germany and the German-occupied territories around 200 Arbeitserziehungslager had been set up in which around 500,000 people had been imprisoned. During the Second World War the Germans established prisoner of war units known as Bau-und Arbeits Battaillon (shortened to B.A.B.). The B.A.B. were made up on average of 600 prisoners of war who were used as forced labour. The distinguishing feature of these forced labour units was that they were mobile; unlike the prisoners who were being held in the Stalag, these workers were not stationed in a specific location but were moved around according to necessity. The I.G. Farben Company was founded in 1925 from the merger of several different German industries. During the Second World War it was the main producer of chemicals for Nazi Germany. I.G. Farben made more use of forced labour than any other industry, particularly during the construction of the plants at Auschwitz. The directors of I.G. Farben were among the accused at the Nuremberg Trials of 1947/48. At the end of the war the decision was taken to split up the industry into its original component parts. The Arbeitskommando were work camps detachments for prisoners who had been captured by the Germans. Usually made up of a few hundred prisoners, they were set up near to places of employment (factories, mines, agricultural establishments etc.). They were run from a central Stalag (prisoner of war camp), which may have been responsible for hundreds of work detachments. The work detachments for Allied prisoners of war were visited on a regular basis by representatives of the Red Cross. 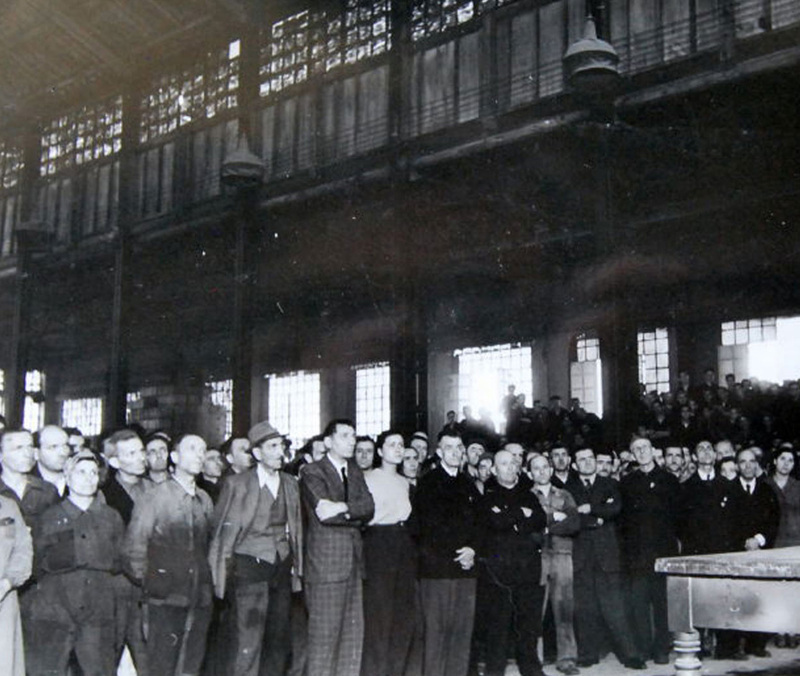 The Military Work Inspectorate was set up in October 1943 with the aim of organising a workforce which was to construct territorial defences for the Italian Republic of Salò and repair the damage caused by air raids. Known as the “Organizzazione Paladino” (Paladino Organisation) after its founder and commanding officer, and operating in strict collaboration with, and at times directly employed by, the Germans, it took on several tens of thousands of workers. The Todt Organisation was begun in Germany at the end of the 'Thirties with the aim of setting up a workforce which would build military defences. The idea of Fritz Todd, who was also its director until his death in 1942, during the war it exploited forced labour in German-occupied countries. In Italy it played a fundamental role in the construction of defences along the Appenines in support of the Wehrmacht, employing tens of thousands of men. Born in Scilla (Reggio Calabria) in 1890, he volunteered for the Corps of Engineers as a telegraphist in 1907. In 1908 he rose to the rank of sergeant, a rank he held throughout the War in Libya. In 1914 he was promoted to the rank of second lieutenant and during the First World War he was made captain. Afterwards he remained in the Armed Forces and in 1932 he was promoted to the rank of lieutenant colonel. In 1936 he took part in the War in Ethiopia, during which he was promoted to the rank of colonel. In the Second World War, he returned to Italy after participating in the Greek campaign and was assigned to the Bolzano Corps. In 1942 he was promoted to brigader general. After the armistice he joined the Italian Social Republic for which he created the Military Labour Inspectorate. He finally retired in 1945 and in 1970 he was awarded the honorary grade of major general. Fritz Sauckel, born in 1894, was a local Nazi party official. In 1942 he was nominated plenipotentiary for the organisation of work throughout all the German-occupied territories. In practice, he was responsible for the compulsory engagement of forced labour. In Italy his organisation tried to round up hundreds of thousands of men to send to the German Reich, with scarce results. He was tried at Nuremberg and condemned to death, the sentence being carried out in 1946. Albert Speer, born in 1905, was an architect who enjoyed an excellent personal relationship with Adolf Hitler. Even though he was not an ardent Nazi, he was the brains behind the staging of the Party parades, thereby assuring for himself the esteem and trust of the dictator. In 1942, after the death of Fritz Todt, he was put in charge of the Ministry of Arms and Munitions, which oversaw the Todt organisation. He was tried at Nuremberg and condemned to twenty years imprisonment. He died in London in 1981. Fritz Todt was a German engineer who was responsible, in the 'Thirties, for building the motorway system as desired by Hitler. At the end of the 'Thirties he set up the Todt Organisation, with the aim of supplying forced labour to be used in the building of defences along the French border. During the war his organisation oversaw the use of forced labour in the occupied territories. He died in a plane crash in 1942. - there is a high mortality rate, which indicates a higher than average workload and a provision of means of sustenance below the necessary requirements. and the German Historical Institute in Rome (DHI Rome).